Manipur Agriculture, Veterinary & Animal Husbandary Minister V Hangkhanlian on Monday said the people need to build up good ideas and relationship with Government and march ahead. Hangkhanlian also urged the people to keep in mind the farsightedness, rationality and the ability to take right decision in hard time possessed by the past leaders to keep the country united and strong. He said this while addressing a programme organised on the occasion of the Sadbhavana Diwas 2018 marking the 74th birth anniversary of former Prime Minister of India, late Rajiv Gandhi at the Banquet Hall, 1st Battalion Manipur Rifles in Imphal on Monday. The observance of Monday’s function will be complement to bringing peace, harmony and keeping our country strong and united, he said. 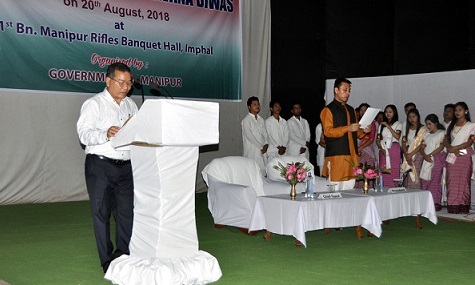 The Minister also appealed to the people of Manipur to take the observance as an opportunity of sharing positive and progressive idea and help the Government for overall development of the country and for shake of the ideas of selfishness to bring cordial relationship to make Manipur a develop state and let us pledge again to take full responsibility in our duty towards the objectives. Minister Radheshyam recalled that Rajiv Gandhi was a great leader who founded new dynamic policy when instability was there in legislative in the politics of India in 1985 and brought up a new resolution to stop defection by introducing Anti-defection Bill in the Parliament and was behind lowering the voting age from 21 to 18. Health Minister L Jayentakumar, Revenue Minister Karam Shyam,MLAs Paonam Brojen,Th Satyabarta,Heikham Dingo,O Lukhoi, Additional Chief Secretary Dr Suhel Akhtar, DGP Manipur LM Khaute and top police and civil officials attended the function among others.